The space left behind by a missing tooth can have an immediate impact, leaving a gap in your smile and hindering your ability to speak and chew. Though these consequences may seem like relatively minor inconveniences, a missing tooth can actually lead to more complex and costly dental issues when left unaddressed. For this reason, Dr. Robin Rutherford urges patients with one or more missing teeth to consider a restorative procedure such as dental implants to restore the integrity of their teeth. 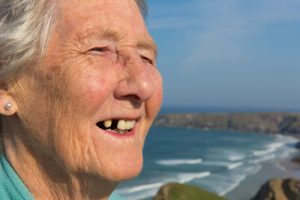 Though bridges and traditional dentures can fill in the gaps left by missing teeth and restore your ability to chew and speak with ease, Dr. Rutherford considers dental implants the gold standard when it comes to tooth replacement. In addition to providing the best defense against future bone loss, dental implants can look and function just like natural teeth. Since dental implants do not require any adhesives, eliminate slippage, and can be cleaned with no extra maintenance, this innovative solution has become a popular tooth replacement option among our patients. For more information about dental implants, or to schedule a consultation with Dr. Rutherford to see if you are a good candidate, please contact us today.